Canine educator is a fancy term for dog-owner trainer! 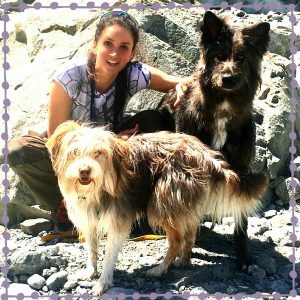 I interviewed accredited canine educator Camilla Torriani about the basic pre- and post-adoption steps to be taken when considering adding a four-legged friend to our life. First of all, who are canine educators and what do they do? A canine educator is trained to support dog owners in learning how to guide and handle their pets within the parameters of the family, in public spaces, and in relation to other animals. Camilla specializes in dealing with dogs and their owners in busy urban settings. She wants all potential dog owners to know that buying a dog is a very important task that needs to be taken seriously. Considering becoming the parent of a dog? #1. Potential dog owners need to assess their lifestyle objectively so that they can be clear on the specific temperament and personality of their ideal mate. “Not many people know that if you live in a small apartment, it’s better to adopt a Neapolitan mastiff than a Jack Russell,” says Camilla. Part of her job is to support potential dog owners to choose a dog, whether a purebred or a mix, that matches their living style. “Sometimes during the pre-adoption interview, it becomes clear that an adult dog would be a better fit for this person or for this family,” continues Camilla. # 2. Proper training is vital. For a canine educator, this is the second step they like to get involved in. Is your dog pulling on the leash? Can’t be left alone? Is your dog not stimulated enough? Camilla to the rescue! She comes to the home, where human and dog share their lives, and offers strategies that complement the well-being of all involved. Much like a marriage, the human-dog relationship is a balance and needs constant re-assessing. Improving the relationship is ongoing and the most rewarding part of owning a dog. You can find more about Camilla Torriani on her website. Though Camilla is based in Milan, Italy, she does internet consultation with dogs owners all over the world.